In the installation, Burgoyne has sixteen pieces of 38" x 60" paper, each with a speaker, a sound circuit, and two copper points. 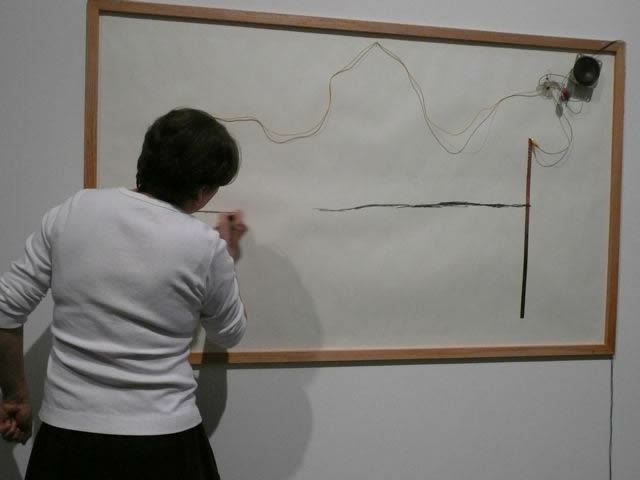 Sound Drawings by Diana Burgoyne, 2001, Concordia, Montreal. The viewers used lead pencils to connect these copper points, thereby allowing a constantly evolving soundscape. For more complexity, each drawing had both a 6B pencil and an eraser, so the participants could completely manipulate the tonal mix of the room by both drawing and erasing. Indeed, even your own body is a resistor. 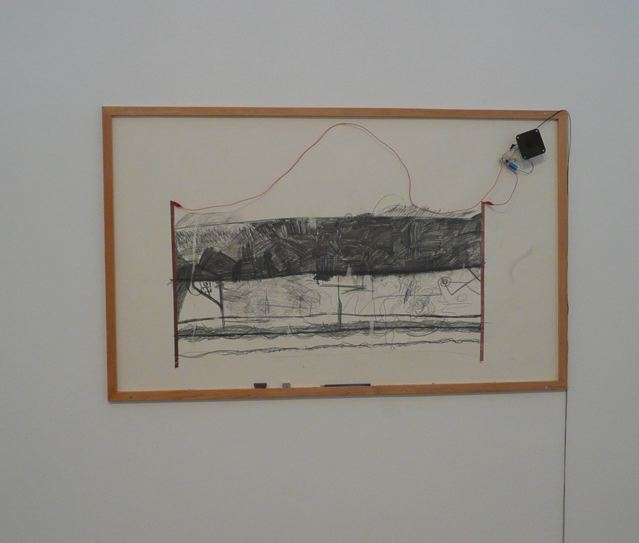 The artist Ross Baldwin has used the body’s natural resistance as a switch to activate his work Neural Connect (2002). Individual viewers were invited to provide their unique resistive signature by grasping two copper probes. 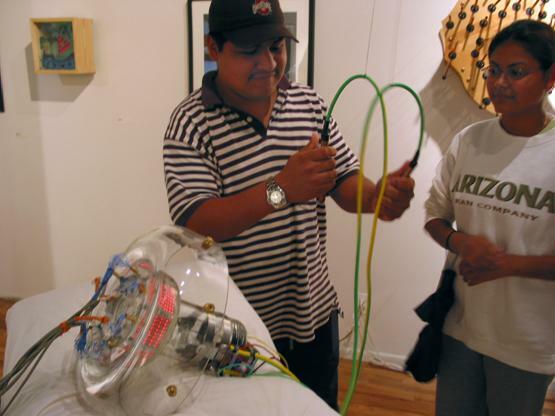 By altering the intensity of grasping force, the viewer could alter the visual and audio output of the digital system. Baldwin was interested in emulating the notion of biological neural circuitry in wires and electronic parts and felt that the bodies own conductive and resistive properties should be exploited. Baldwin used LEDs as indicators that the neural connection was made. This caused the BS2 processor to trigger random patterns of flashing LED arrays, which referenced the random patterns of neural firings in the human brain. The round glass and pillow that Neural Connect rests on also allude to the form of the human head. (No humans were hurt in this work, as the number of electrons that Baldwin was pushing through the body was not enough to cause any damage to the cells). Molecular collisions in the passage of current, be it a human body, a 6B lead pencil, or a resistor create resistance and therefore heat. The resistor’s ability to absorb and disperse heat from all of the molecular collisions is the wattage rating. You must be aware of the Wattage rating of resistors as it refers to the current resistors can absorb and be given off as heat. As with wire generally the thicker a resistor the more electrons you can push through it and the more heat it can withstand. The most common wattage sizes are 1/8, 1/4, and 1/2 watt. You will be using 1/4-watt resistors for the lessons in this book. There are also 1, 2, and 10-watt resistors and resistors with 10,000 watts for large industrial applications. Size vs. wattage rating. Generally the larger the resistor the more current it can handle. If you try to push too much pressure of voltage and amperage through a resistor that is not able to absorb all the molecular collisions they can overheat and may burn up. This can be a smelly and smoky affair. Resistors are designed to absorb given amounts of electron current (I) measured in amps (A) and dissipate power (P) measured in watts (w) that is transferred to heat or light. In the image above, notice the different thicknesses of the resistors. The large 100 and 10-watt resistors have more mass to absorb and pass more electrons, and more surface area, which comes into contact with cooling air that allows the heat to be wicked off the surface of the resistor. The red 50-watt resistor has a hole through the middle of the resistor. The hole increases the surface area to allow heat to be wicked off by cooling air. In the smaller carbon resistors at the top of this image above, notice how the resistors increase in wattage rating from 1/4 to 2 watts as they increase in size. In order to properly select resistors, you will need to understand how to measure them with a multimeter as well as understand how the color codes that circle the resistor related to the quantity of resistance. You can calculate the quantity of resistance available in a resistor by looking at the color bands around the resistor. Each color band has an associated number assigned to it. Here is resistor chart. 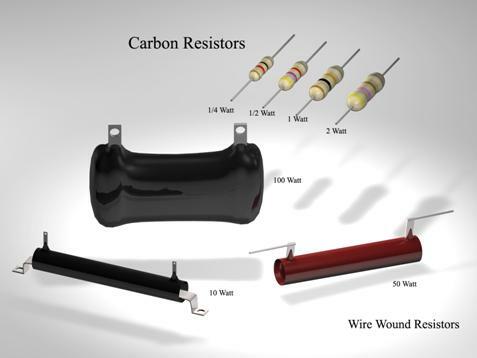 You can identify resistance available in a resistor by the color band chart, shown below. The quantity of resistance is measured in ohms, named after Georg Simon Ohm (1787--1854). This is designated by the omega (Ω) symbol. It simply refers to the quantity of resistance or ohms that a material presents to the passage of electrons. So if a resistors color bands give you a value of 1000. then we would say that resistor is a 1000 ohm resistor or 1000 Ω resistor or 1KΩ resistor. These are all equivalent.